Sixteen-year-old Natalya Pushkaya has one dream and one dream only: becoming the best ballerina ever. Dancing's always been who she is and she's working her hardest to land the main role of the School of Performing Arts' end-of-the-year showcase. But...will she make it? Within a week, Natalya's life will be changed forever. This is a novelette not a full length novel. Currently the first book in the series is only $.99 on Amazon. "Mama always said that dancing requires sacrifices. I just never thought she also meant sacrificing people." This is well-written glimpse of the story to come. I enjoyed the characters and am ready to read the full story of what comes next. 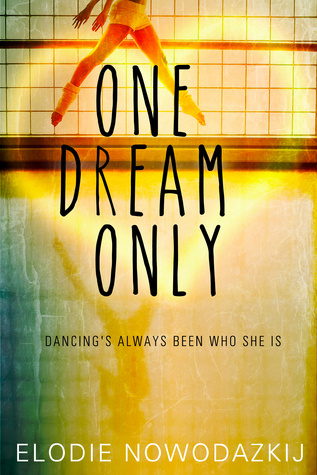 One Dream Only is the sad prequel to Ms. Nowodazkij's book One, Two, Three. Natalya's dreams are smashed with one accident. Will she ever be able to realize her dreams? Will she and her mother overcome what haunts them? I've rated this with only 3 stars solely because it is so short and is not a full story. However, it is well-written and edited. I found several things I liked within the story. The chapters are short and sweet. To start with the story alternates between present day and the past. I found this to work well for the story. My one wish is that the book started out with more of an introduction of the characters. It wasn't until a few chapters into the book that I knew the main character's name. However, now that I go back and and think about it the book starts with the accident and things aren't clear in Natalya's mind. So it's very possible that the novelette was written this way to lend to the confusion of the main character. Now that I think about it this way, I actually kind of like it. It's an interesting writing style. This story was written after the first book in the series. I don't know if they were meant to be read out of order or if this story was only an afterthought. I did read this story first in the series. One more thing that I would like to note about this story is that it is available in an English/German edition. One page is in English and the next is translated into German. I thought this was a such a neat concept. I studied German in high school and college and would have loved to have something like this to use to study the language. I will put a link to this version below as well. I will definitely be going on to the first book in the series! You can connect with the author at her Facebook page at https://www.facebook.com/groups/954159761294820/ or check out her website at http://elodienowodazkij.com/.